Never judge a phone by its cover. This chunky, black box was in fact the world's first 'smartphone'. 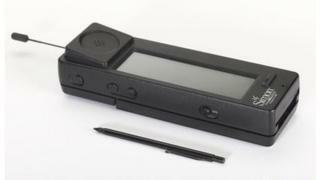 The IBM Simon went on sale to the public on 16 August 1994 and combined mobile phone technology with a wide range of computing features. To mark the 20th anniversary, London's Science Museum is putting it on display in its new Information Age gallery. "The Simon wasn't called a smartphone back then," said curator Charlotte Connelly. "But it had a lot of the features we see today. It had a calendar, it could take notes and send emails and messages and combined all of this with a cell phone." Weighing in at 500g (1.1lb), the Simon was not exactly pocket-sized. However, Ms Connelly insisted the design was ahead of its time. "It looks like a grey block but it's not as big as you'd imagine," she said. "It had a stylus and a green LCD screen, which is similar in size to the iPhone 4. In fact, it's not a bad looking thing." IBM's pioneering product was also the first mobile phone to feature software apps and could be linked up to a fax machine. It was only available to customers in the United States, operating within a 15 state network and sold around 50,000 models. The device was particularly popular with members of the business community, who craved a transportable phone that doubled up as a mini-computer. However, a hefty price tag and limited battery life contributed to its eventual disappearance from the market around two years after its launch. "It only had an hour's battery, it was $899 and there was no mobile internet at the time. So it wasn't very successful," said Ms Connelly. The Simon will go on display this October as part of the Information Age exhibition - the first permanent gallery in the UK dedicated to the history of communication and information technology. More than 800 objects will be on display, illustrating how far communication has come over the past 200 years. Ms Connelly said the exhibition also acts as a reminder of a different era, free from constant connectivity. "It does remind us of that time. I definitely enjoy getting away from things and deliberately disconnecting myself," she said. "There's something quite nice about that." A Point of View: Are humans too devoted to their own machines?